Share this product and receive a $1.90 sharing discount. The Sacrament of Baptism, First Holy Communion and Confirmation are very special milestones in the lives of those who follow Christ. 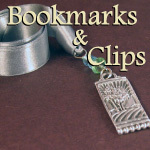 You can commemorate the special day by gifting a personalized pewter bookmark. You select the charm based upon the event and then tell us what text you would like stamped. Do you have a favorite Bible verse? Is your child going through Confirmation and have a special verse? These custom dog tags are the perfect place to put your favorite Bible verse or Bible verse reference. 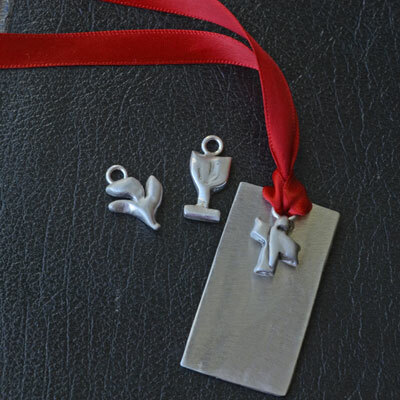 The pewter dog tag measures 1” x 2” (classic dog tag size) and comes on a red ribbon. The dog tag can hold 130 characters (numbers, letters and punctuation Total - both sides). One side can nicely accomodate about 55 characters. Stamping is in all Captial letters. Customize one side or both. Names, Dates, and Scripture References are all wonderul sentiments to stamp! Add up the total number of characters being stamped on front and back and then check the correct box! The finished dog tag comes boxed. Please include any instructions that you would like for us to follow in the Customer Comments Section. For example... do you prefer the text to be positioned vertically or horizontally? We generally select the direction that looks best for the wording. Please phone us with questions. 866.834.0356 or 203.834.0356. Custom tags can take about 2 weeks to get to you. THIS IS A PERSONALIZED ITEM THAT CAN NOT BE RETURNED FOR REFUND UNLESS WE HAVE MADE AN ERROR OR THE PIECE IS DAMAGED, IN WHICH CASE WE WILL HAPPILY RECTIFY.